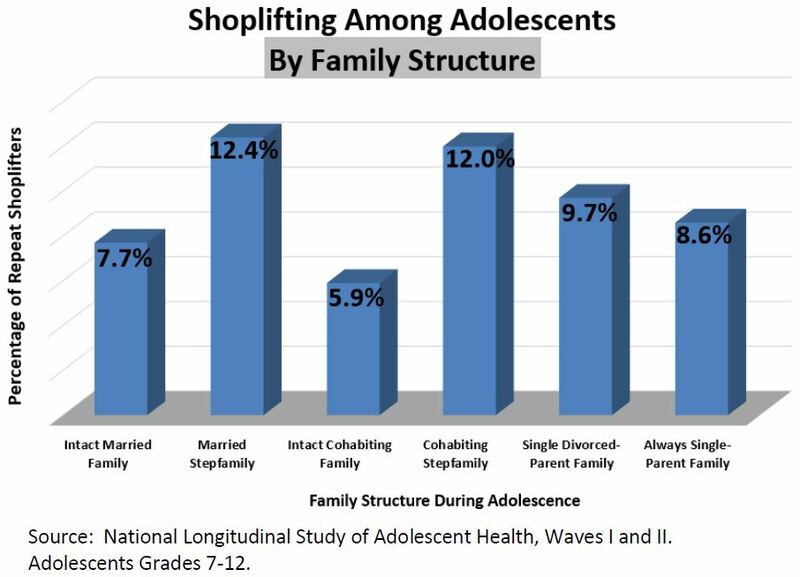 Family Structure: According to the National Longitudinal Study of Adolescent Health Waves I and II, only 7.7 percent of adolescents living with married parents and 5.9 percent of adolescents living with cohabiting biological parents were repeat shoplifters (3+ times). Almost 9 percent of adolescents living with a single never-married parent and almost 10 percent of adolescents living with a divorced parent had shoplifted repeatedly. This percentage jumps to 12.4 percent for adolescents living with a stepparent or with one natural cohabiting parent (12 percent). 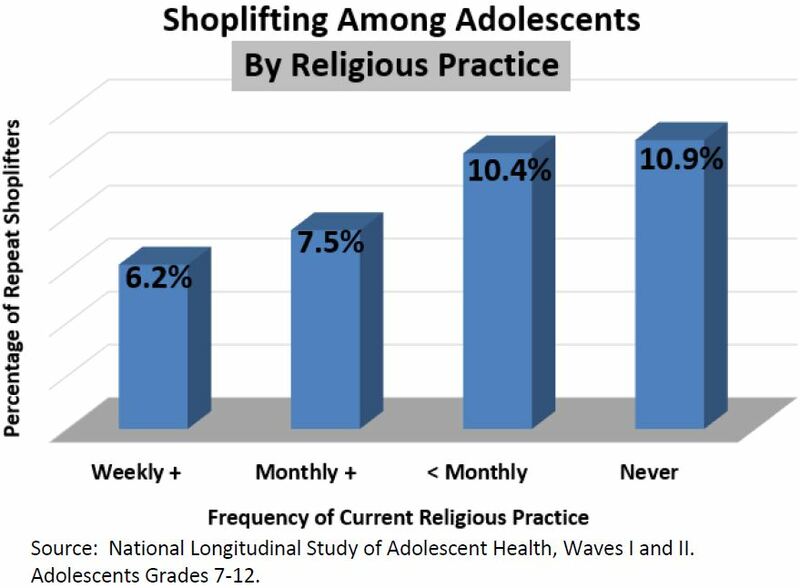 Religious Practice: Whereas only 6.2 percent of students in Grades 7-12 who worshipped at least weekly had shoplifted three or more times, 10.9 percent of those who never worshipped were repeat shoplifters. In between were those who attended one to three times a month (7.5 percent) and less than once a month (10.4 percent). 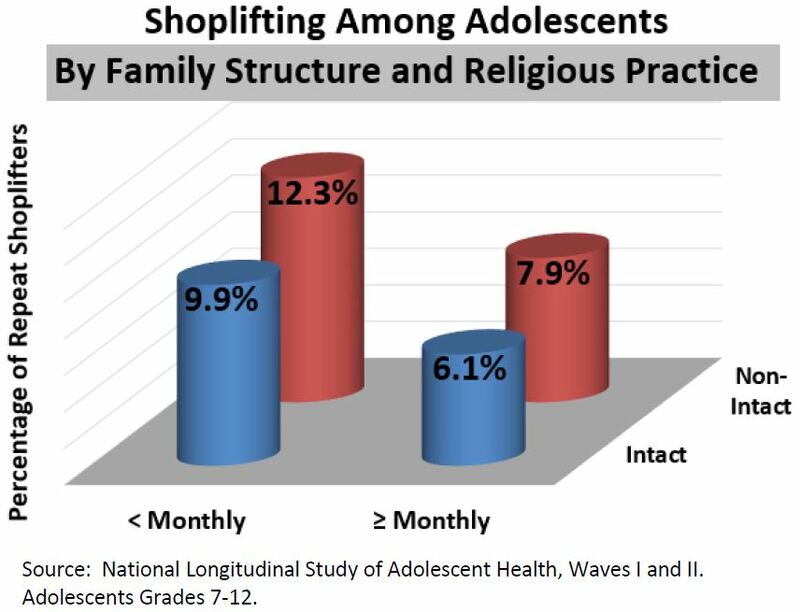 Family Structure and Religious Practice Combined: Only 6.1 percent of adolescent students who lived with both biological parents and worshipped at least monthly had repeatedly shoplifted. By contrast, over 12 percent of adolescent students who worshipped less than monthly and came from single-parent or reconstituted families had shoplifted repeatedly. In between were those in non-intact families who worshipped at least monthly (7.9 percent) and those who lived in intact families but worshipped less than monthly (9.9 percent). Related Insights from Other Studies:  Several studies corroborate the direction of these findings. Byron Johnson of Baylor University and colleagues found that while religiosity in adolescents has a negative impact on delinquency, adolescents who live with both biological parents are also less likely to associate with delinquent friends. Jerry Trusty of Texas A&M University also reported that the greater the import adolescents place on religion and the more often they attend religious activities, the more likely they are to have involved parents and the less likely they are to be delinquent. Byron R. Johnson, et al., “Does Adolescent Religious Commitment Matter? A Reexamination of the Effects of Religiosity on Delinquency,” Journal of Research in Crime and Delinquency 38 (2001): 22-40. Jerry Trusty, “Relationship of High School Seniors’ Religious Perceptions and Behavior to Educational, Career, and Leisure Variables,” Counseling and Values 44 (1999): 30-40.